Once, long ago, a third of the way into my tenure here at Streetside, I wrote about one of my favorite cars of all time: the Caterham Seven. It wasn’t a review, since my chances of getting behind the wheel of a Seven could only be found with an electron microscope. This is no longer the case. After more than six years, I’m moving on from Streetside to work for another company. To congratulate me, my incredible coworkers here in marketing bought me my dream car: A Caterham Seven. And not just any Caterham Seven. It’s a 620R, the single fastest production car Caterham has ever made. Like all Caterhams you can buy here in the States, it came as a kit to skirt government crash test regulations and all of that nonsense. So last weekend I built it, experienced it, and showed it off. 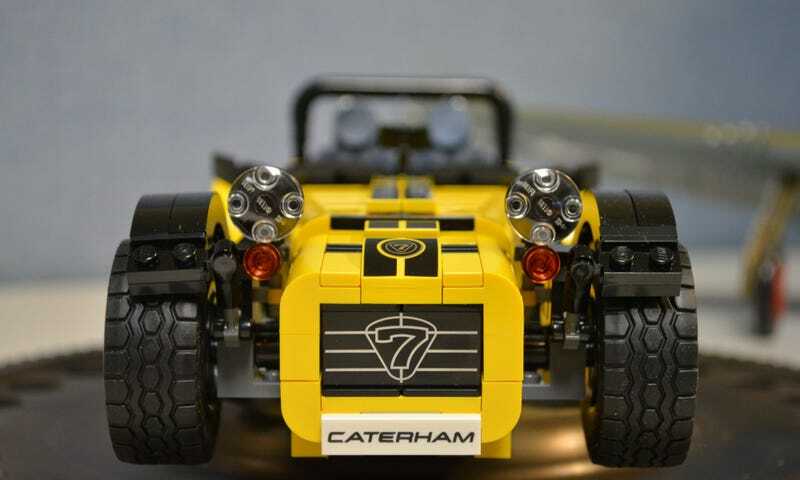 Top Gear once famously built a Caterham in a single day, though they mucked it up considerably. Most Caterham builds take weeks or months. I beat them all, and put mine together in a blissful 4.5 hours. Yes, despite the fact that the kit came with 771 teeny, tiny pieces, they were organized in several individual packages according to their stage of build. Drilled rotors are a track day essential. Moreover, Caterham provided an excellent, color, pictorial instruction book, 192 pages long, so clear and easy to understand that it didn’t even need words. This is truly a global car. What other kit includes tools? In short, it was a snap. I didn’t even need any tools, save for once, when two parts seized together and I had to separate them, but Caterham included this tool with the kit. The gauges are even canted. How cool is that? Caterhams are classically known as handling machines, so you’d think that the complete lack of steering would have a negative effect. Not so. Thanks to the super grippy 49.5×20 radials at all four corners, it handles as well as any Caterham ever has. Behind them, drilled rotors fill the dishes, so late braking was never an issue. The grip will rearrange your organs. Acceleration is a savage, thoughtless thing, thanks to the 620R’s supercharged 2 liter Ford Duratec four. It reliably forces 310 brake horsepower through the six speed sequential transmission. More than enough to rocket the Seven’s 1,201 lb curb weight. (Mine felt even lighter.) The Seven reaches 60 in an unfathomable 2.79 seconds. The pedal box is very tight. Some other Caterham owners have suggested a pair of Pilotis for this. Yes, there are technically production cars that do it faster, but nothing does it better. With the seat cushion mere inches from a lightspeed conveyor belt of asphalt, with the world pouring in over the carbon aeroscreen and the low gunwhales to either side, it feels like I had been fired from some kind of cosmic gravity cannon, hurling through the universe, bending time and reality. Panel gaps make it all the more lovable. The completed built quality is about what you’d expect from a British classic first designed in 1957. The flying fenders flap and quiver at speed, there are massive panel gaps all over the body, and the aero-optimized nose cone pops off with the slightest pressure. But I just don’t care, because this car is beautiful. It’s a timeless form made beautiful by six decades of sheer function. It catches eyes wherever it rumbles, and constantly prompts conversations. The morning after I built the Caterham, Kansas City played host to the annual Heart of America Concours d’Elegance, a fancy British car meet in midtown’s picturesque Crown Center mall. I parked my Seven in a file of Jaguar E-Types, where it looked right at home amongst its vintage British brethren. I fully expected to win both Best in Class and Best in Show, but I decided not to stick around for the judging. I couldn’t sit still. I only wanted to drive. Full disclosure: This article originally appeared on StreetsideAuto.com, but I don’t work there anymore, and I still work here.